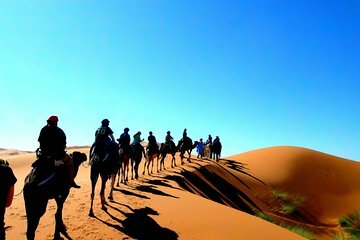 Discover the magic of the Sahara Desert on this 2-day trip from Marrakech. Enjoy a scenic ride past palm groves, kasbahs, and stunning desert landscapes. Explore Kasbah Ait Ben Hadou, a UNESCO World Heritage Village, and visit Ouarzazate, the Hollywood of Morocco. Ride a camel through the sand dunes and sleep under the stars in a Berber camp.